Medieval II: Total War, released in the year 2006, is a diplomatic, strategic war game. Players can control factions across Europe, such as England, France, Germany and Spain. Medieval II: Total War was seen by some as a backward step since at first glance it appeared to be no more than an update of the original game, when a number of fans were eager to see another era covered. However the amount of new features more than justifies the decision by Creative Assembly. The graphics are a major improvement, and although a pretty decent system is needed to show them in their full glory, they can be really spectacular. The units themselves are richly detailed, showing upgrades on the battlefield such as better armour and the units are no longer the clones they were in Rome: Total War, with different faces, shields and helmets making up realistic-looking troops. The in-game videos of assassination attempts make a welcome return as you see your assassins more often than not bungling their sabotage/murder attempts and meeting a sticky end. Just about the biggest innovation is that settlements can either be castles or cities, with their own set of soldier types and buildings. The castles also make less money and are harder to capture. This is a feature I really like since it means there is a greater scope for specialisation. The campaign map is also larger so that you can face the mighty invading armies of the Mongols and Timurids in the east and late on in the game there is even the possibility of invading the New World - though the Aztecs in your way are no pushover. There are other units on the campaign map to take into consideration such as the merchants who you can position on resources shown on the map to add to your coffers. Heretics and witches appear in your lands and if not swiftly dealt with may bring down the horror of the Inquisition upon you. Indeed religion and and in particular the Pope plays a stronger role this time around, with him giving you missions if you are Catholic faction, and excommunicating you if you are disobedient or are aggressive to your Catholic neighbours. However the improved priest promotion system means that when the pope dies you have the chance to get your cardinals elected as his replacement if you have one. The action takes place between roughly 1200 and 1500AD in the grand campaign and you are initially given the choice between only 5 factions (England, France, Spain, the Holy Roman Empire and Venice), but meeting the victory conditions allows you to play one of the many other nations caught in the struggle, from the Moors in the southwest to the Russians in the northeast. Each faction has its own unique units and there are such a wide variety (over 250) that it takes a while to get to grips with each new one as they all have their strengths and weaknesses - such as the Danish who have great heavy infantry, but weak cavalry, or the French who have fantastic heavy cavalry, but suffer from weak infantry early on in the campaign. The main draw of the game is the real-time battles, which can be fought between thousands of troops, particularly if you are trying to defend your city from the Mongol hordes. The controls are relatively simple, particularly if you have played any of the other titles in the series. The game is not without its flaws however and the AI and diplomacy system leave something to be desired. There are apparently a number of bugs, though I have been lucky to not have been troubled by them myself. There are also criticisms over some of the historical accuracy, but overall the developers have done a great job of balancing the history and fun game-play. Frustratingly there is still no option other than to auto-calculate naval battles, leaving the fate of your fleets to chance. Very much recommended to strategy game fans, particularly those who enjoy the micro-management aspects as much as the massive real-time battles. Similar to previous titles of the Total War series, the game let you take control of a faction of the Medieval times, and to build a civilization, both economically and militarily in order to conquer other factions. it also allows you to take control of the factions diplomacy, religions and other social issues in the campaign map. Its a turn based game and during the player's turn, armies, agents and fleets could be moved around the map. when 2 armies engages each other, the player can personally fight the battle, which involves real-time strategies ( the battle is what makes this game brilliant ) or automatically calculate the outcome via the AI. 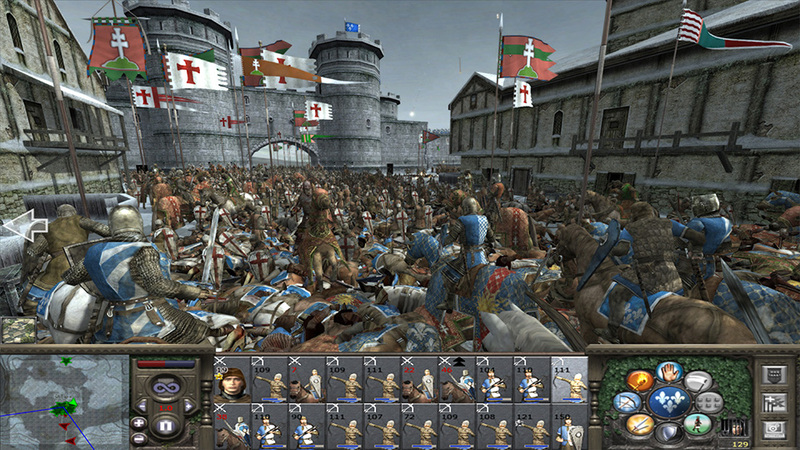 During battle mode, the player could deploy armies, using different units consisting of infantry, cavalry and archers to crush the opposition, each nations have different units and must be used to its advantage in order to win. The game also include famous historical battles such as The battle of Arsuf, Agincourt and Padua, taking control of different armies and change history!